Why this hotel? Iconic buildings. Stylish rooms. Great service. Free WiFi. Belvedere is arguably one of the best hotels in its class. 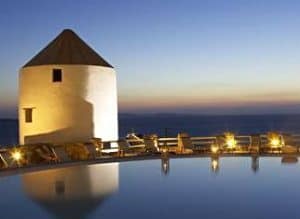 Comprised of 7 iconic, whitewashed buildings overlooking Mykonos Town and the sea beyond, the Belvedere offers a range of rooms and suites, some with fabulous sea views. The hotel has a wonderful swimming pool and sun terrace with luxurious sun loungers and cabanas, two bars, a spa, gym and two highly-rated restaurants. The service is exceptional. 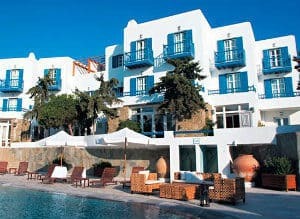 Located just a 5-minute walk from the gay scene in Mykonos Town and just moments from the Elysium. Great choice if budget is not an issue.